Large Basket: You will want your stroller to have a large basket at the bottom to hold everything from those souvenirs to spare diapers! At the end of the day, you will be grateful for the extra storage! Cup Holders: Cup holders are a must for not just your child, but for parents! Save room in your storage basket and make sure the stroller you choose has extra cup holders for those bottles of water! Comfortable: Your child may be spending a lot of time in their stroller, especially if they will fall asleep in it. The strollers that you can rent from Disney are hard plastic, so make sure you find a stroller that has enough cushion for your child to be comfortable. Recline: After a couple hours of fun at the Disney Parks, your little one might be out for the count. If they sleep well in a stroller, there is no reason for you to head back to the resort! Recline that stroller and then keep on exploring! Canopy: The combination of the hot Florida sun plus parks with little shade makes having a canopy for your stroller a must! Lightweight: You will have to fold the stroller when getting on and off trams and Disney transportation, so a lightweight stroller is a must! Make sure it is easy to fold up also! Safety: You should always make sure every stroller you purchase has great safety features! Make sure it has a safety belt to buckle your child in. 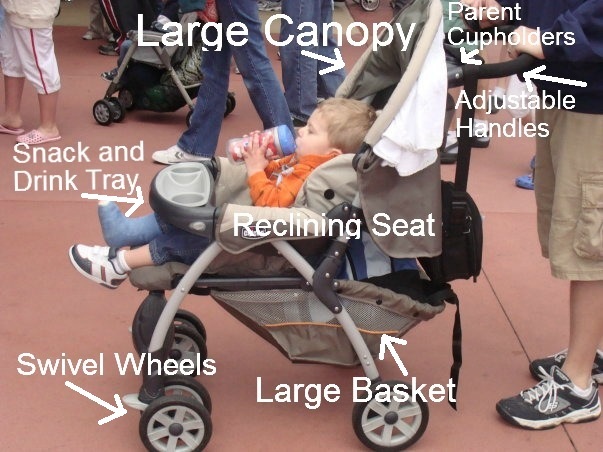 It can get very busy at Disney World and strollers can get bumped. Adjustable Wheels: Not necessary, but it will come in handy when trying to navigate through crowds. Strollers with wheels that easily swivel will be perfect for the parks! Easy to clean: Make sure that whatever stroller you bring to Disney World is made of fabric that is easy to wash! Little hands with Mickey Bars and cotton candy tend to stain a stroller and you’ll want to wipe away any mess! Adjustable Handles: Most small strollers that are lightweight and great for traveling feature short handlebars! That works for parents that are under 5’4”! Look for a stroller that has adjustable handles, so it’s comfortable for both parents! Everything you need in a stroller! The above stroller is a Chicco Cortina Stroller. Weighing it at 25 pounds, it’s a little on the heavier side but folds up nicely. It also fits all of the other criteria on our Top 10 list! Make sure to read our posts on the Best Strollers to Bring to Disney World and the Best Stroller Accessories! I hope you don’t mind if I share my Patent Pending Invention here. It was a huge help to me, my baby didn’t get burned on our trip, and since having it on our stroller I can’t live without it! We’ll be having our Grand Opening SOON! Looks like a fun accessory! Outside each attraction and restaurant there is an area for stroller parking.